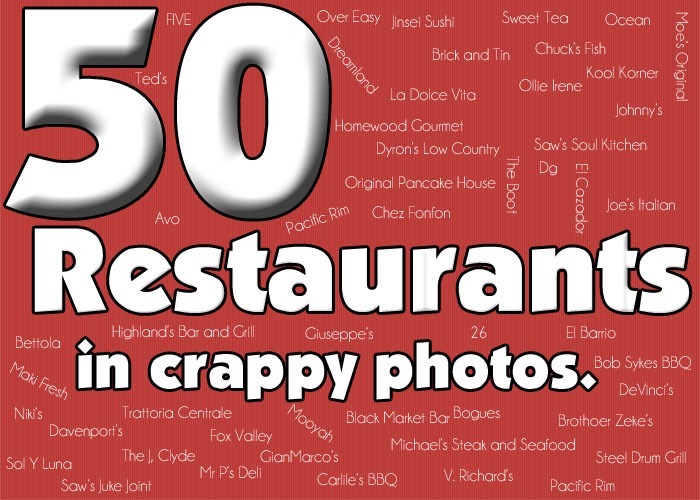 50 Restaurants in Crappy Photos: Tampa Edition. So I realize that this series is supposed to be strictly Birmingham restaurants. But I’m a rulebreaker, and we went to Tampa. Therefore, you get a Tampa edition. But really, this is just an excuse to tell you about the most curious restaurant experience we’ve ever had – you won’t want to miss restaurant # 6. 4. 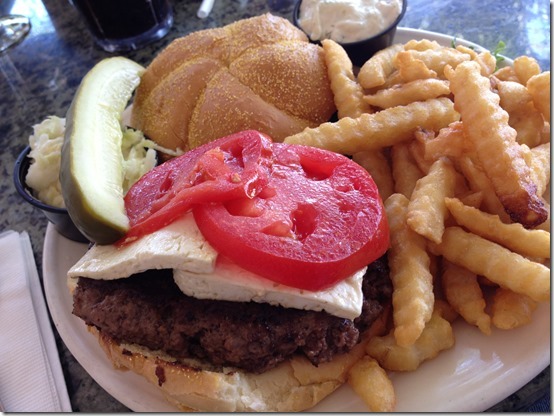 Louis Pappas Market and Café – As I mentioned before, one of the reasons we chose Tampa was so that we could visit Tarpon Springs, a Greek town about an hour out of Tampa. 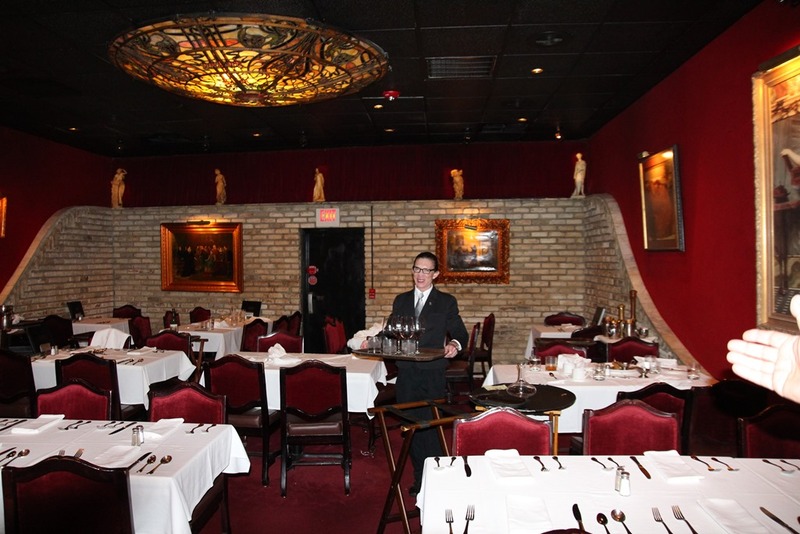 It was a special surprise that Tampa, also, was covered up with Greek Restaurants. When our flight arrived, it was cold, rainy, and nearly time for rush hour traffic, which we heard was especially bad. So we decided to wait it all out by having dinner downtown at Louis Pappas. 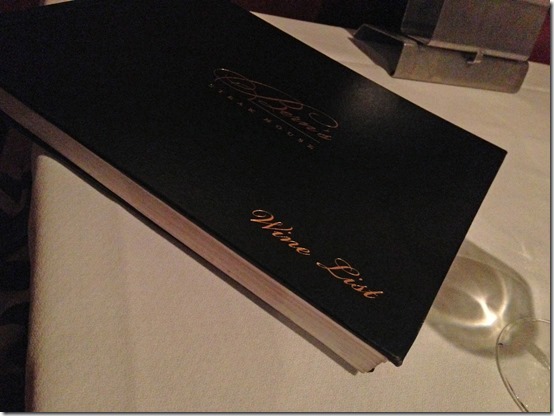 We studied the menu for about ten minutes, trying to narrow down what we wanted – because I for one wanted everything. 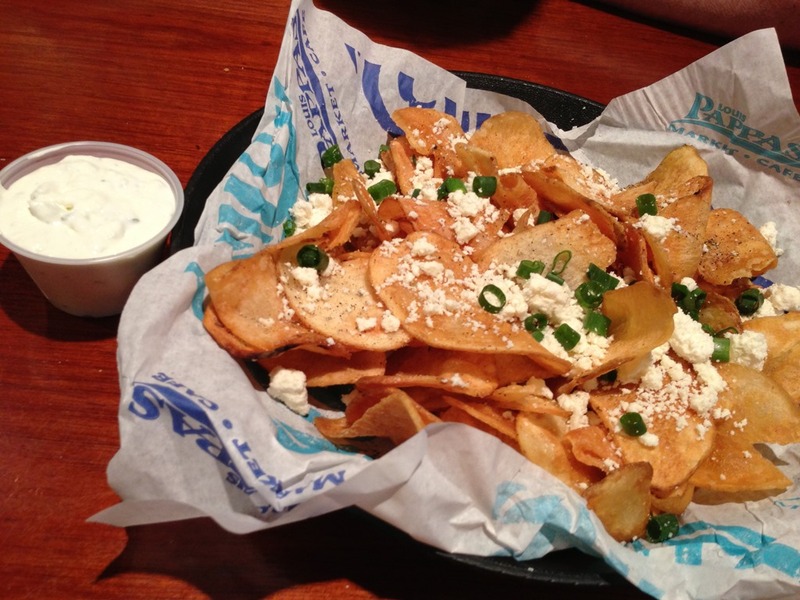 We started out with Greek Fries. Greek Fries are one of those vague menu items that can be anything from soft wedges of potatoes floating in Olive Oil, to French Fries with oregano sprinkled on them, to homemade potato chips. These Greek Fries were of the potato chip variety. 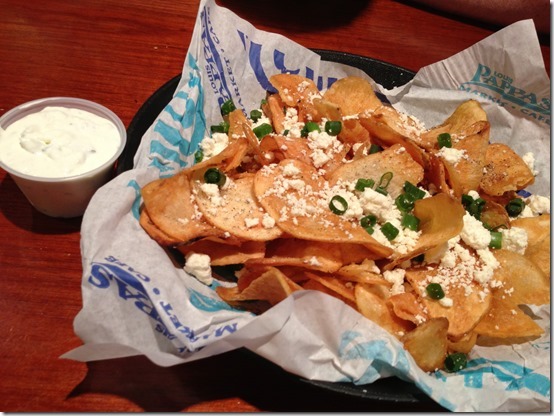 But these potato chips were freshly made, still hot, and had feta and green onions sprinkled on top. AND were accompanied by my favorite sauce in the world, Tzatziki Sauce, as a side. I know I could have been fine with just this, but I also ordered the Greek Chicken and Rice. 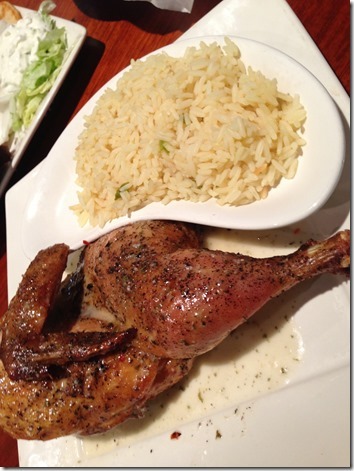 It seems a rather simple dish, but Greeks do chicken differently than anyone else – they will serve you the juiciest, most flavorful piece of poultry you will ever put in your mouth. And this one definitely lived up to the stereotype. I didn’t care for the rice (it had an out-of-place seafood taste,) but it’s not like I needed it after all of those chips. 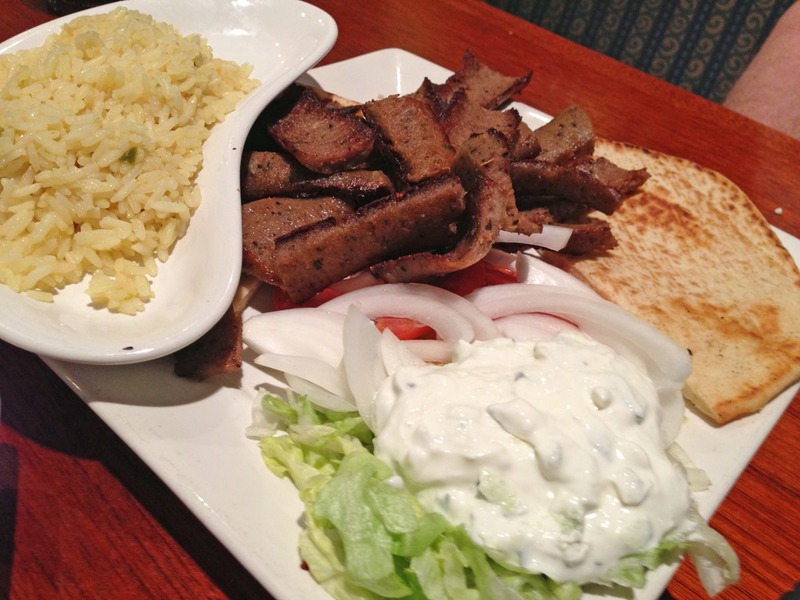 Chris asked them to give him whatever would give him the most gyro meat, and so he ended up with the Gyro Platter. And he was well pleased. 5. 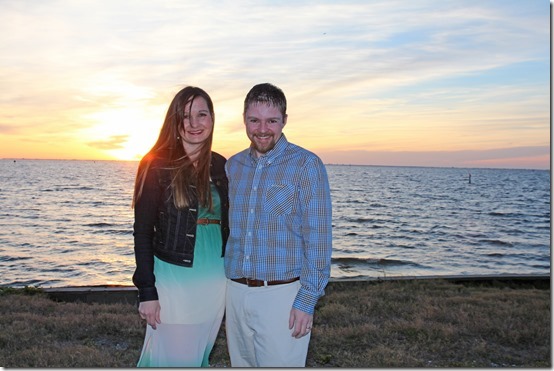 The next day, we wandered down the St. Petersburg Beach and popped in a completely random Greek Restaurant called, of all the unappetizing words to name an eating establishment, Skidders. And Chris ordered a Pizza. It wasn’t anything completely fantastic, but it was a great outdoor meal. But the experience I really wanted to tell you about was our Flagship Anniversary Dinner. 6. 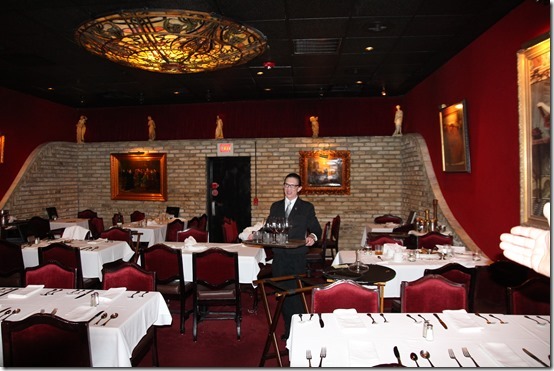 Everyone that knew anything of Tampa told us that we had to eat at Bern’s Steakhouse while we were there. Nobody. Not a single person. NOT A SOUL. 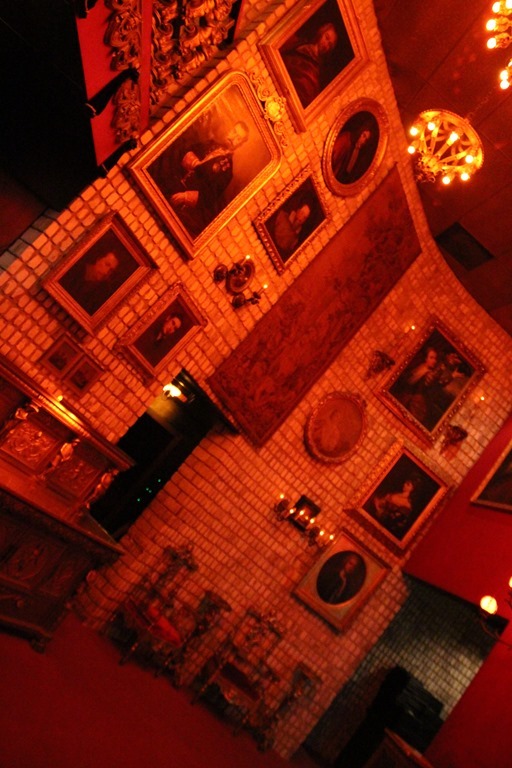 Mentioned that it was also the creepiest restaurant this side of Transylvania. The website was our only clue: when Chris read that the meal included dinner, a tour of the kitchen and wine cellar, followed by another table in the dessert room upstairs, I made jokes about that old story my Dad told – about the best steakhouse in the world that gave kitchen tours…but no one ever returned. But we were sure that the similarity ended there. We dressed in our best, as there was a strict no-denim policy. 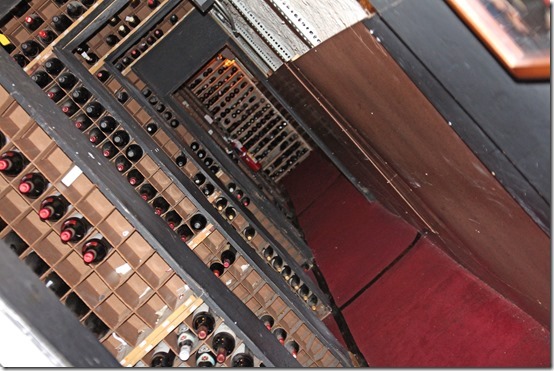 The sign was simple and unassuming for the restaurant with the world’s biggest wine collection. 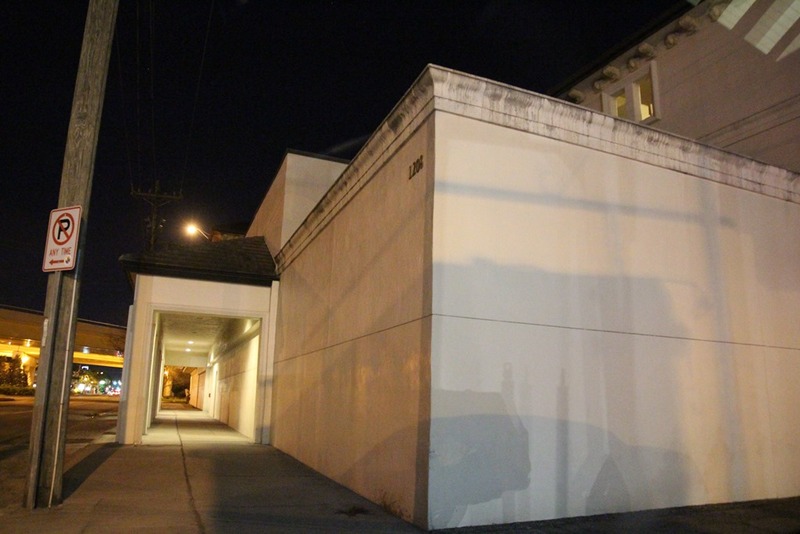 The building had almost no windows, looking more like a Sanatorium or Secret Society than Tampa’s best restaurant. 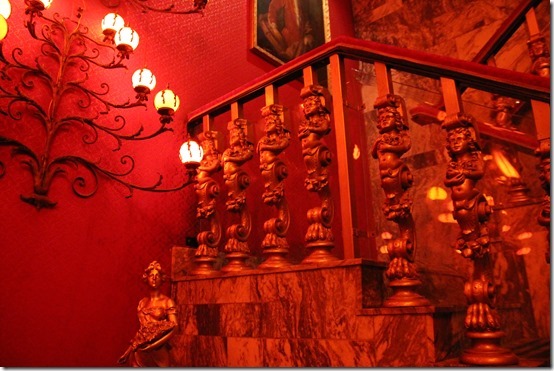 And the minute we walked in the lobby, we felt like we had been dropped into the movie Clue. 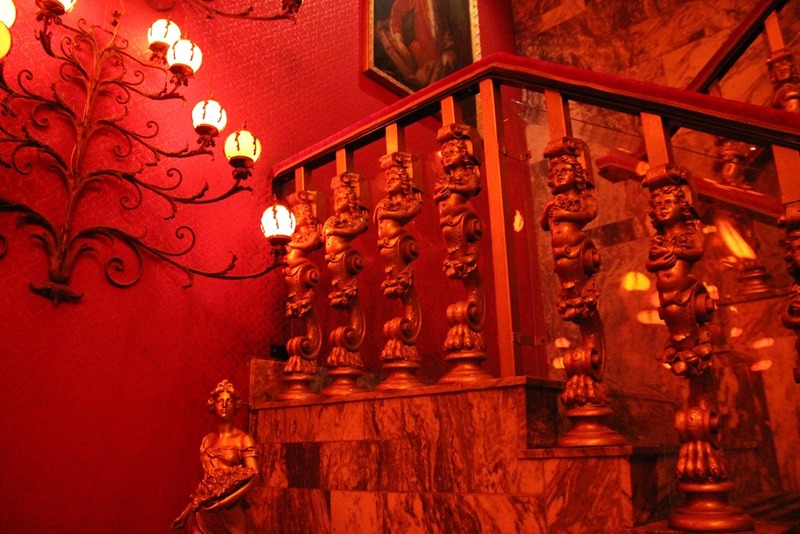 The sconces had an otherworldly orange glow to them, and their tentacle-like fingers holding the glowing orbs in place were not at all comforting. The walls were covered with portraits that made you certain their eyes would follow you as you walked. 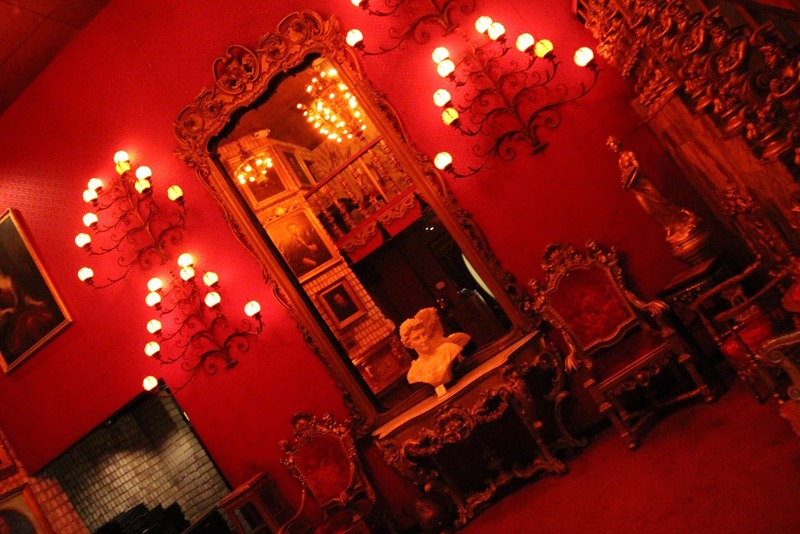 And the sheer amount of red-tinted grandioseness of the whole place was quite stunning. Despite the fact that they had something like seven or nine or maybe five dining rooms and the place was Scooby-Doo’s-Doghouse/Mary-Poppin’s-Purse gigantic on the inside, we couldn’t get reservations until 9pm. We got seated somewhere around 9:15pm, and our waiter was a jubilant and endearing older gentleman from the former Yugoslavia. During our meal, he told us the same phrase six times – because we counted. I was distracted from the menu at hand by the encyclopedia of a wine list. 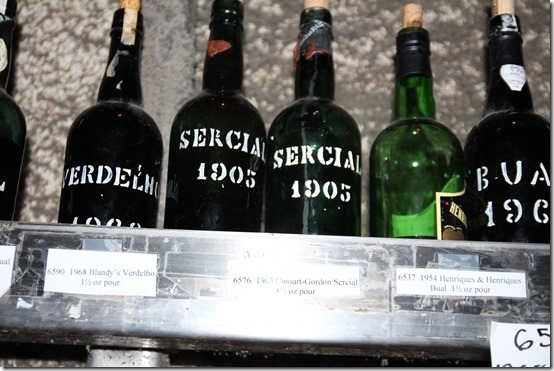 I was determined to find the most expensive wine available – just to see what it was. 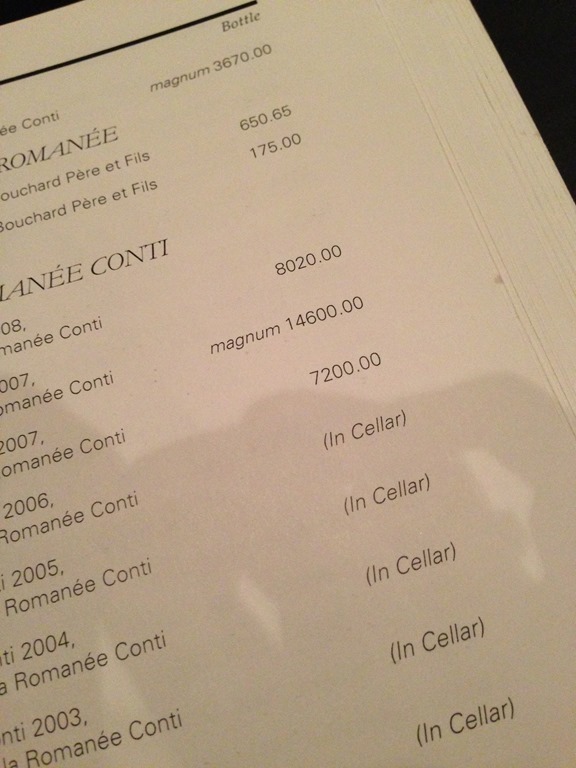 I thought I had found it…but later, our waiter informed me that no, the most expensive bottle was actually $30,000. On to the food. 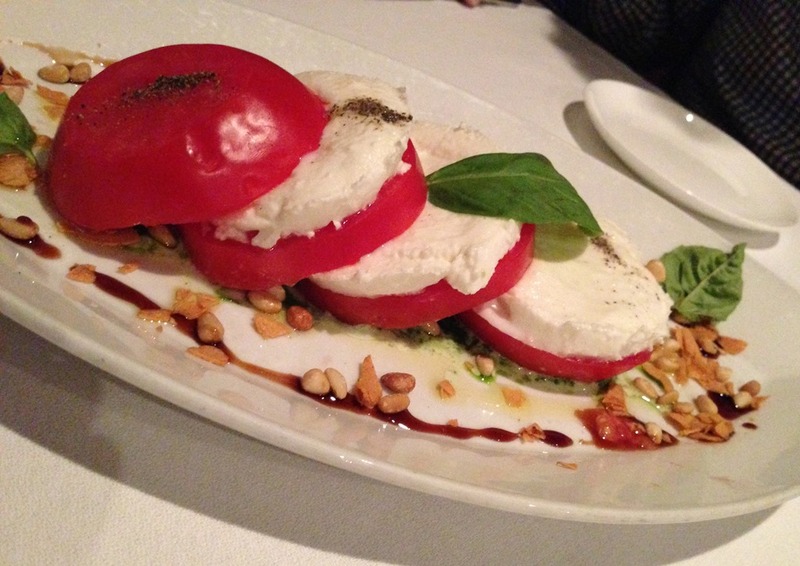 We’re on a Capresi Salad kick, and this one was the best we’ve had. Not surprising, since they grow their own tomatoes and make their own cheese. Next, he brought us French Onion Soup. 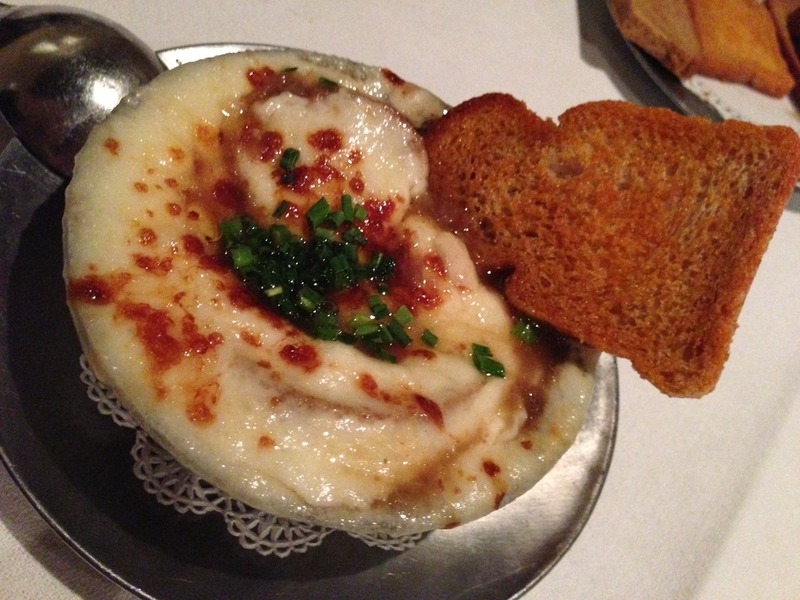 French Onion Soup is always a surprise for me, because I expect it to be a thin, low-calorie soup. I always forget about the inch-thick cheese on top. But I’m pretty sure I scraped the bowl clean. And yes, it was an amazing salad – especially since I’m on an extreme avocado bender. Finally, our steaks, potatoes, and onion rings were brought out. 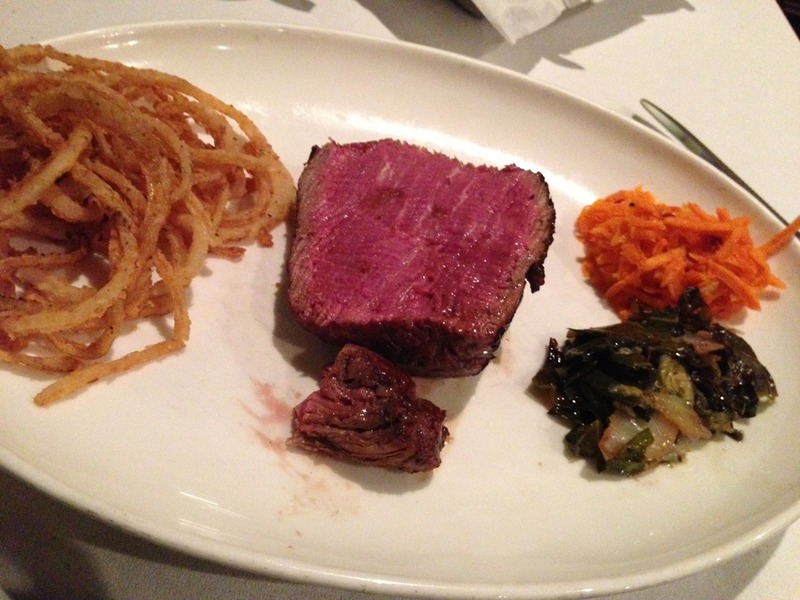 Thanks to the last three courses, I wasn’t at all sad that my steak was small – and still ended up taking most of it with me. 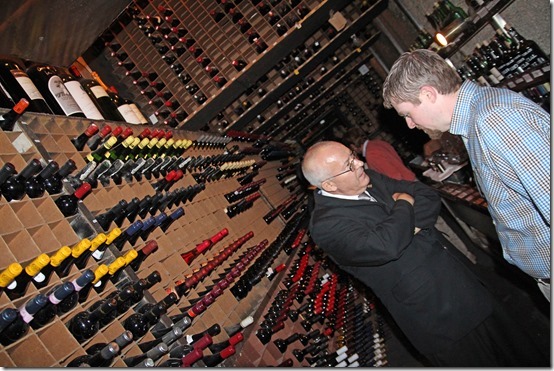 After dinner, it was our turn to tour the kitchen and wine cellar. Our waiter led the way as we walked through room after room of medieval fancery. By this time it was 11:30pm, so the kitchen was spotless and the butcher knives were all clean for the night – something that made for uninteresting photos, but was greatly comforting with regards to our fate. 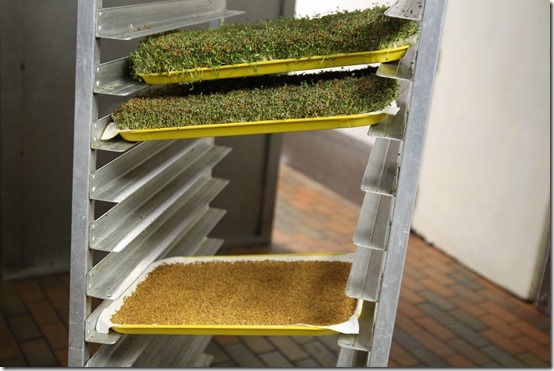 I did spot the growing sprouts, though. Next on our tour was the wine cellar, where Chris and our waiter had a serious talk about the security of such a place. 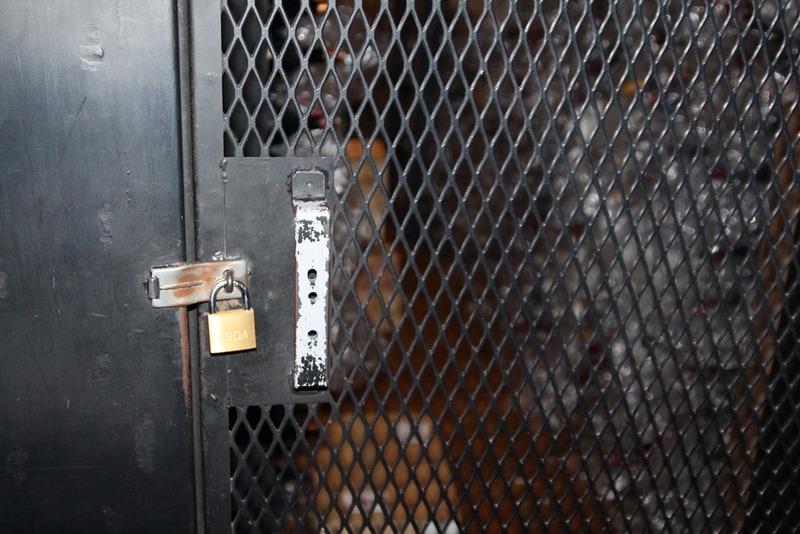 There was an entire wing behind metal bars and padlocked, and only one man had the key. 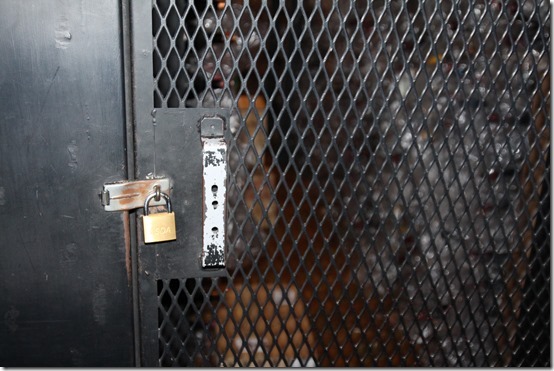 If you wanted that $30,000 bottle, I’m pretty sure they would run a credit check first. 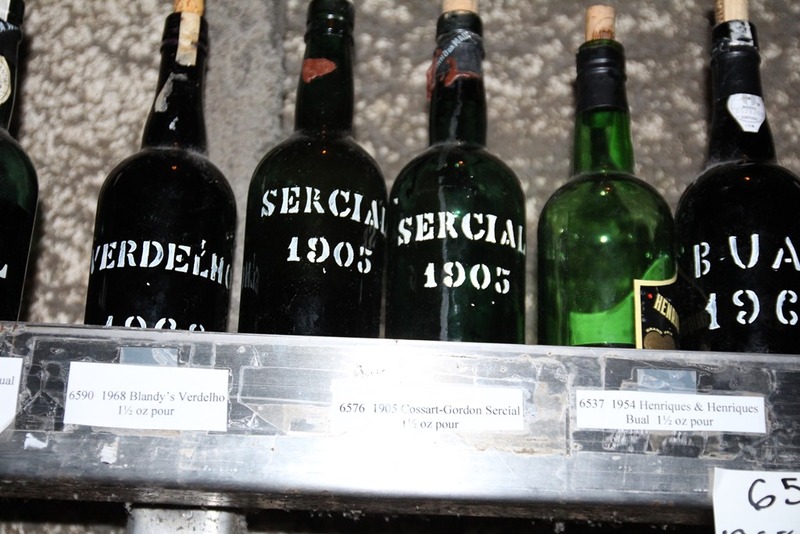 And the age of the bottles was equally impressive. As we were passing back through on the way up to our dessert booth, all of the dining rooms were empty and set for the next day’s customers. 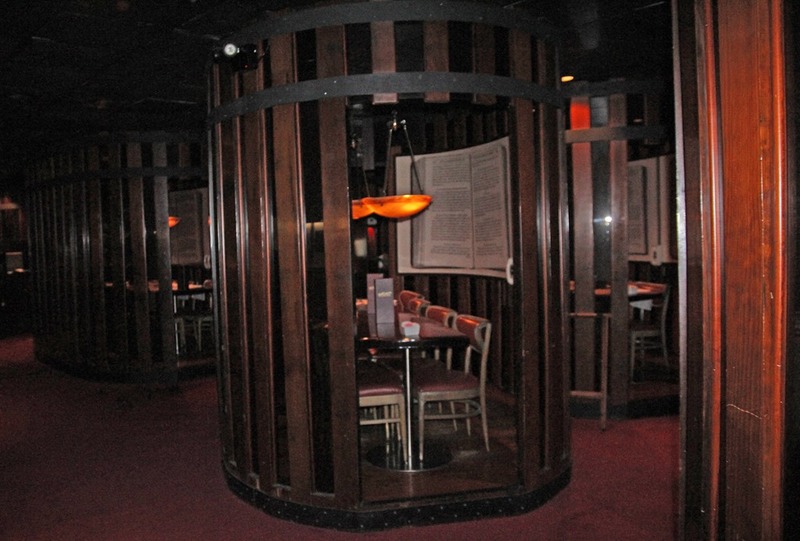 The dessert floor was full of different sized, oval-shaped private booths made out of old wine casks and Plexiglas. 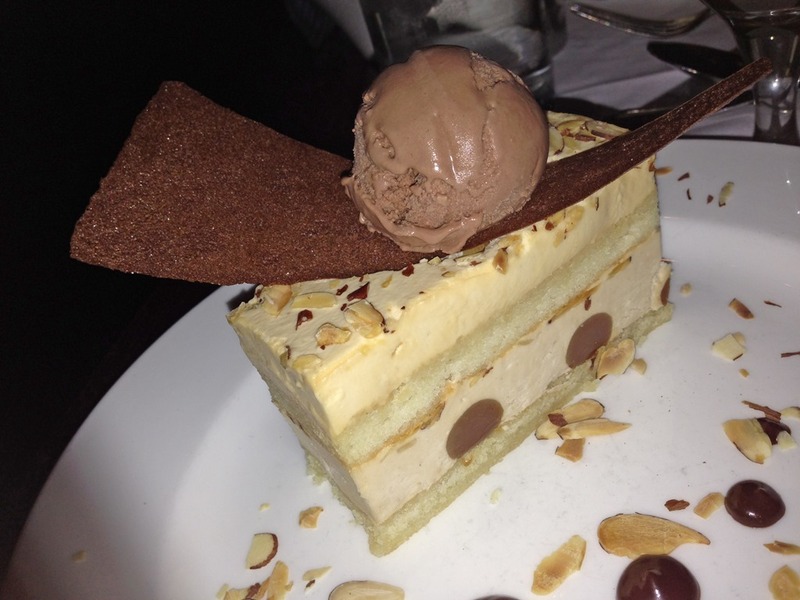 It was dark and bizarre, but the dessert menu made it all worth it. Also? 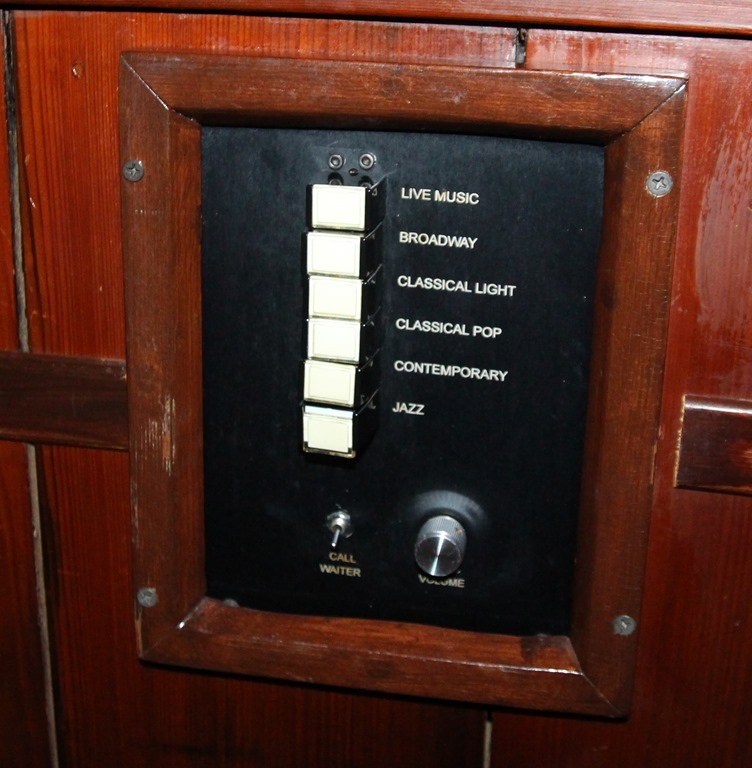 Each booth had musical choices and it’s own volume control. 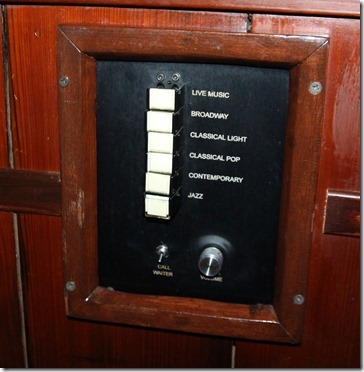 We started with the live music, but the pianist gave it up at midnight, so we moved on to anything that would keep our mind off of the fact that we were enclosed in a soundproof casket after midnight on the second floor of a windowless building. But again. 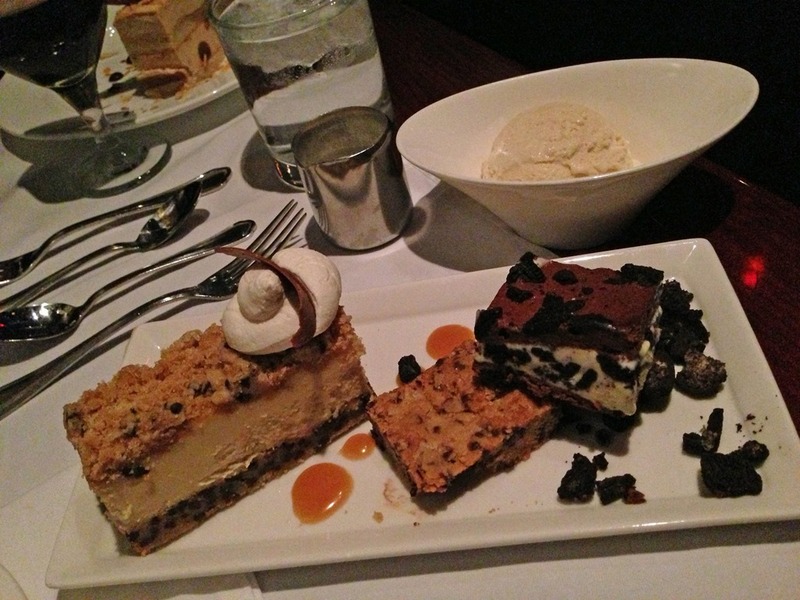 The desserts made it all worth it. These people clearly have a good deal with a printing press. And a wide range of clientele. 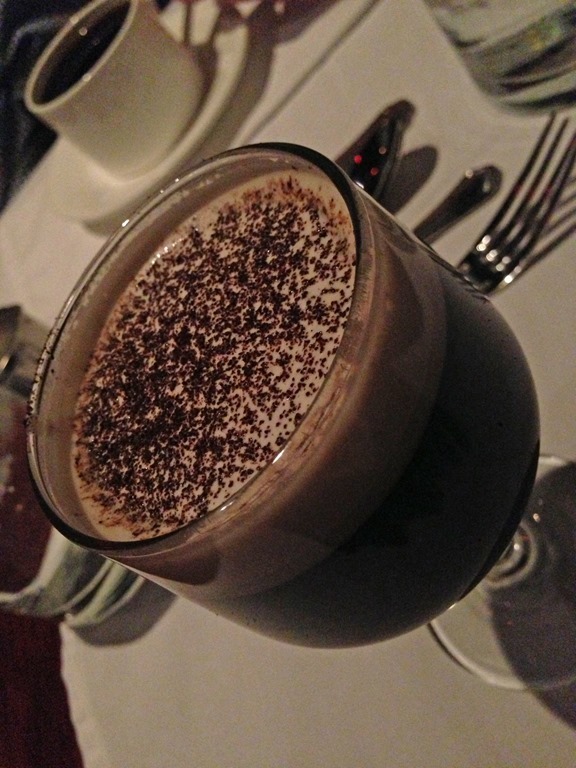 You can get a $3 cup of hand-picked, house roasted, ground & brewed to order coffee (which Chris loved,) or you can mortgage the crown jewels and try 1 1/2 ounces of a rare Remy-Martin cognac blend for $1200. I repeat – for an ounce and a half. To go along with my Hazelnut Cake. The amount of calories we consumed in that restaurant was embarrassing, and our scale still testifies to that truth. But every one of them was worth it. In summary, we arrived at 9:00. Two tables, two waiters, a tour, and 3 1/2 hours later, we rolled ourselves to the car at 12:30 in the morning and managed to drive back to our room. And we’ll just leave it at that. Next Post On Impressing My Seventeen-Year-Old Self. Previous Post Stepping Stones of Early Readers: What to Read and When. I’m way impressed. Definitely a restaurant that needed reviewing, even if it’s not in Birmingham! Dang, we just got back from the Tampa/St. Pete area and we didn’t go to Bern’s! Was it super expensive for what you ordered? One of these days, I just want to try a sip of wine that costs $30,000/bottle just to see what the fuss is all about! It was the most expensive meal we’ve ever eaten, for sure. And you’re right – it would be amazing to know if it was just hype or not, but then again, I think I’d feel like I was choking down a hundred dollar bill or something. Oh surely you’re not leaving out the amount of the final bill from that tables/waiters/tours/time tally at the end of the story! Absolutely. We need to know these things! I honestly don’t remember. I need to dig out the receipts. oh yes Bern’s is a legend in Tampa. 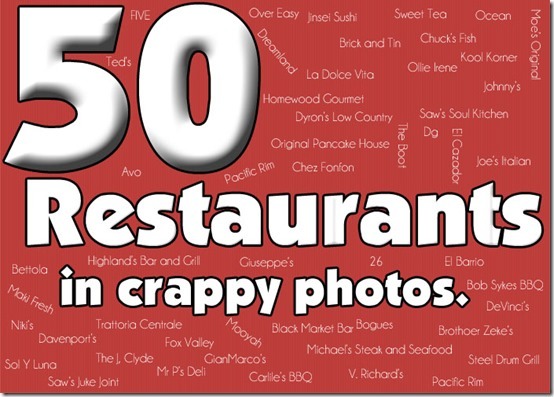 Lived there most of my life and have never been able to eat there (because I would have to mortgage something) . 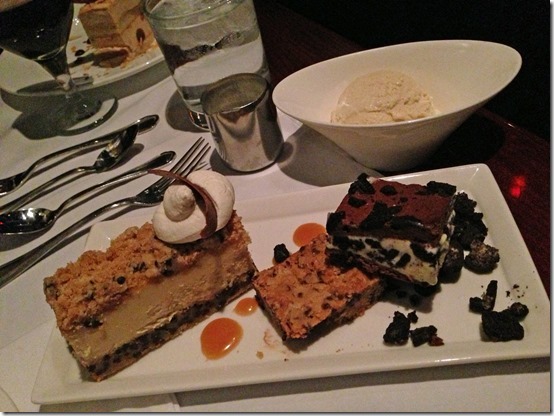 I always was intrigued by the idea of a separate room just for desserts. I can’t believe you didn’t have some authentic Cuban food while you were there. 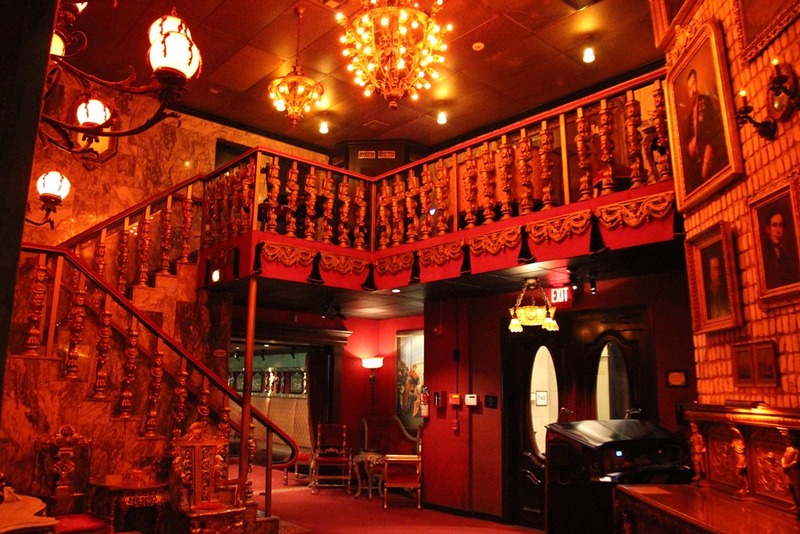 There are some great ones like the Colombia in Ybor city. 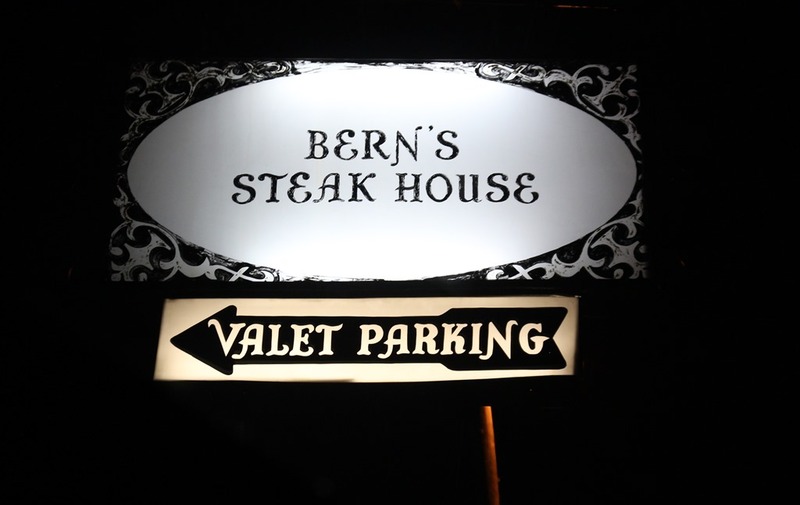 Glad you liked Bern’s even if it was a late night and the decor was a little over the top. You’re right – we should have done Cuban! It was on our list, but we didn’t get to a lot of things on our list. Thanks so much! You’re too sweet. Wow that place IS creepy! I think I would have left. Too creepy, especially at midnight! The empty restaurant would be way too scary. :) Oh, and you’ll be happy to know that since your other post for Birmingham we went to this hole in the wall place I’ve always wanted to try. 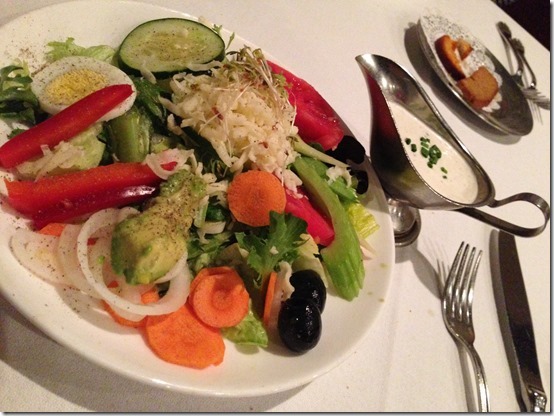 The place looks way old and outdated, but clean and the food is AMAZING! Seriously my new favorite place! And cheap too! T and I got a huge sandwich/calzone type thing, small pizza, and cheesy garlic bread (so good) for $16 (plus tip)! So thanks for the push to try something new! 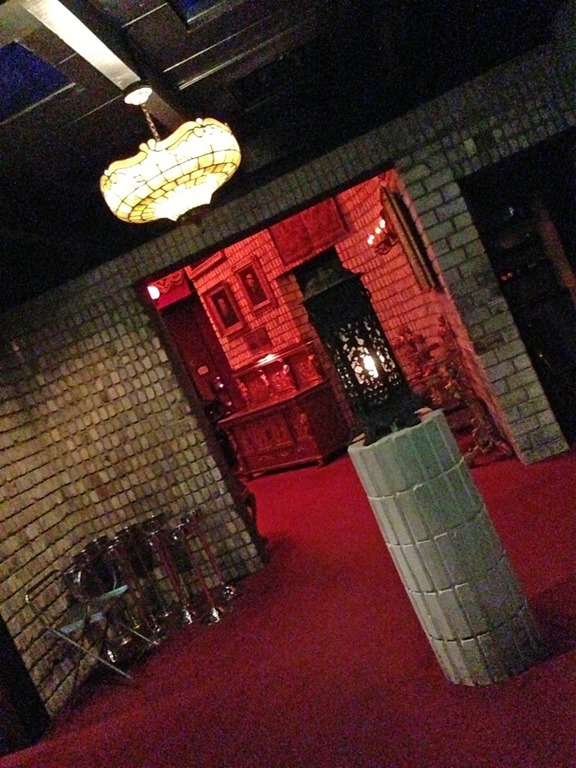 Yes, all of the lobby pictures were taken after midnight when the place was empty – it was super creepy then. And yay for trying new local places! That’s awesome. THATS AWESOME! You know Scott and I love places like that!! 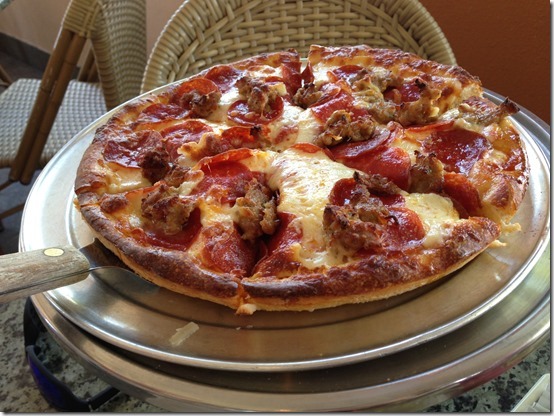 We ate there once a couple of years ago when we were departing from Tampa for a cruise. A high school friend lives there and offered to watch our son for us that night. It was delicious! I find this SO disturbing. But, um, it looks really yummy, too. Gasp! Sputter! Boggle! I know where I want to go for my 12th anniversary!!!! This cracks me up on so many levels – to us Floridians, Bern’s is a landmark, but every time I’ve ever been there, I’ve been waaaay creeped out by the ambiance. 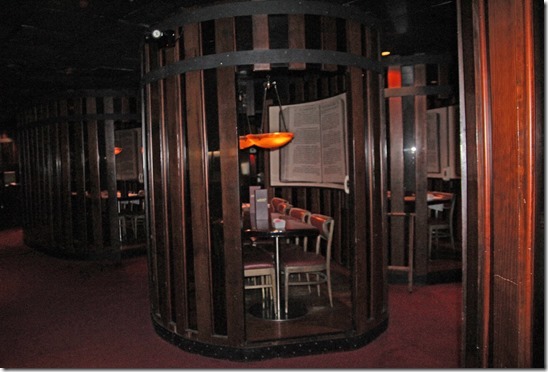 It’s been a few years, but used to, you could make separate reservations at the dessert side so you could get the ambiance for a couple hundred dollars less. The Columbia Restaurant is another must visit – maybe when you guys plan your Disney trip, as there’s one in Celebration that’s just as good. As a Floridian, raised in the Tampa area, and lived about 1 1/2 blocks from Bern’s, it was easy to take it for granted. Sundays after church were huge family gatherings at Mercedes in Ybor City in the heart of Old Tampa & special Friday nights at Bern’s. 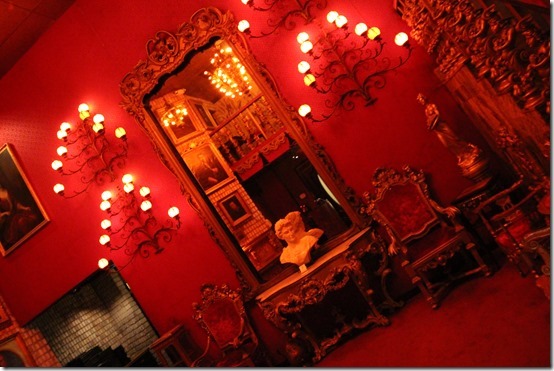 The baroque atmosphere is off-setting to some. But to locals, it was a way of separating what you were about to enjoy as a steak-centered feast from the rest of our Florida beach and sunshine culture. That’s why there are no windows or outside seating as found almost everywhere else. Another way of explaining it: Old Tampa was a haunt for the NY mob where Bern & Gert were from. I do not in any way imply they were part of that scene. 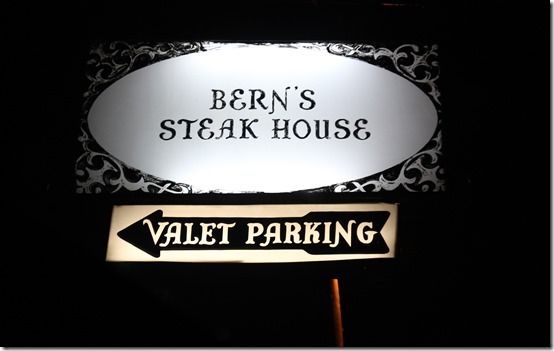 But Bern’s can easily be seen as the type of place that clientele would have felt at home, blowing serious money on the finest dining they could imagine. When the dessert room opened, the wait was so long, they stopped taking reservations for anyone unless you were there for dinner. If you truly take in the whole experience, you can learn quite a bit about steaks, wine, and cheese. It is the best tasting educational experience one could ever imagine.